An interdisciplinary climate conference run by graduate students, for graduate students, held each fall. The 12th annual Graduate Climate Conference was held on November 2-4, 2018 at the Pack Forest Conference Center. The event featured almost 120 participants, a marked expansion from past years made possible by generous support from the National Science Foundation, PCC, and other sponsors at UW (for a full list of sponsors, see the GCC website). The larger size of the conference this year made it possible to accommodate a wider spectrum of climate-related disciplines. An unprecedented number of travel grants were offered to both U.S. and international attendees. The conference program featured seven sessions of student talks and poster presentations, as well as a keynote presentation from Heidi Roop (UW Climate Impacts Group) entitled, “Imagining a new climate science ‘ecosystem’”. The 11th Graduate Climate Conference was held November 10-12, 2017 at the Marine Biological Laboratory on the south shores of Cape Cod, MA. This conference focused on bringing together graduate researchers who think about climate from all disciplines, including but not limited to atmospheric, biological, earth, and ocean sciences, geography, anthropology, public policy, and economics. The conference is unique because only students attend, providing a rare opportunity for the next generation of climate researchers to interact without the inhibitions that accompany the presence of faculty and senior scientists. Applications were open by the end of April and the deadline for abstract submission was in June. Food, lodging, and conference registration fees were provided by our generous sponsors; travel grants were provided on an as-needed basis to as many participants as possible. For more information, and a link to the application page, visit the official website: http://gradclimateconf.mit.edu. 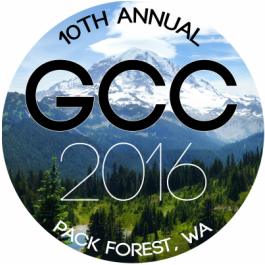 GCC 2016 was the 10th Graduate Climate Conference, the first was organized by graduate students at the University of Washington in 2006. As the conference grows in demand and scope, the responsibility for hosting the GCC rotates between the University of Washington and Massachusetts Institute of Technology/Woods Hole Oceanographic Institution. These conferences continue to provide a range of session topics that will help future leaders in climate science meet and share ideas. Backgrounds of past attendees have spanned a wide range of disciplines including atmospheric sciences, biology, environmental economics, forestry and fisheries sciences, oceanography, public policy studies, and earth and space science. The format is designed to encourage new climate scientists to become acquainted with the details of diverse areas of climate research and to place their own research in the broader context of the climate science community.